Francis Ford Coppola's Blancaneaux Lodge offers riding with its own stable of horses and guides. 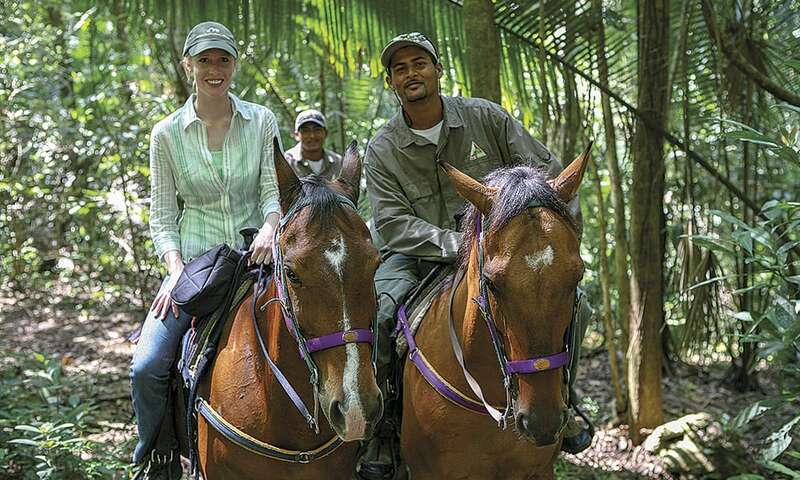 Darley and her Blancaneaux Lodge guide ride off into the Belize jungle towards Big Rock Falls. I never imagined that in Belize I’d be riding to a waterfall, stripping out of my jeans and diving into chilly waters in the middle of a rainforest, but that was just one of my adventures while riding from Blancaneaux Lodge to Big Rock Falls. 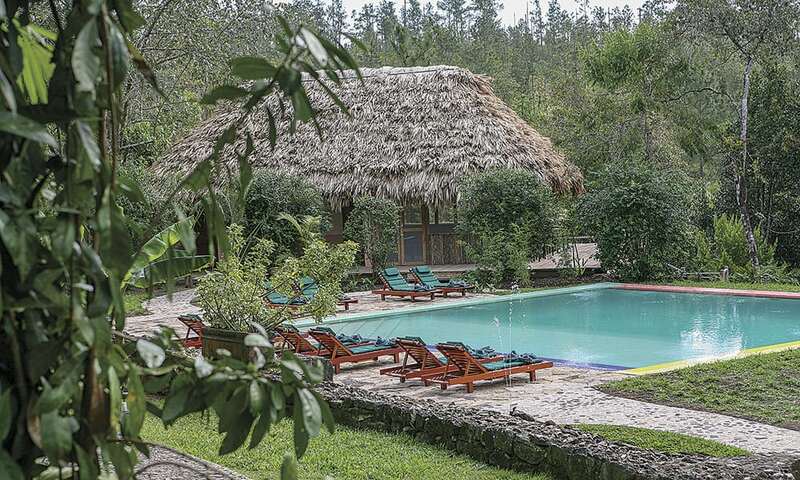 Owned by famed film director Francis Ford Coppola, Blancaneaux Lodge is located in Belize’s Mountain Pine Ridge District, a remote and lesser-trod area close to the border of Guatemala. What could be more romantic than a sunset horseback ride? What about riding to a secret waterfall, hidden deep within a tropical paradise? You can do both at Blancaneaux Lodge. An increasingly popular place to vacation and retire, Belize is lush, wild, English-speaking, and diverse. Bordering Mexico and Guatemala on the Caribbean Coast of Central America, Belize is small and rugged, offering eco-adventures that will truly take you off the beaten path. One of the pools and cabana at Blancaneaux Lodge. This is the perfect escape for those looking to recharge and add a little romance to their vacation. Coppola visited the remote jungle setting in the 1980s and created this boutique, luxury resort. Strolling the grounds, you may feel as though you’re on a movie set: It’s jungle perfect with colorful flowers adorning the well-kept stables and shaded walkways, and thatched-roof cabañas perched on the banks of the Privassion River, where tropical birds seem to fly by on cue. Blancaneaux is an example of an eco-friendly, self-sustaining resort, meaning you can stay here and feel good about staying in harmony with nature. The river provides hydroelectric power to the resort. Fruits and vegetables are grown on the grounds in an organic garden. Horses, too, are born and raised here. My docile horse was bred at Blancaneaux’s stables, a tidy area surrounded by vibrant tropical flowers. Next to the stables, an intricate organic garden brims with purple cabbage, plump tomatoes, fresh basil, and other fresh ingredients you may find in your meal or a fresh cocktail at Blancaneaux. Nearby, we visited ruins and caves that the Maya believed led to the underworld, Xibalba. 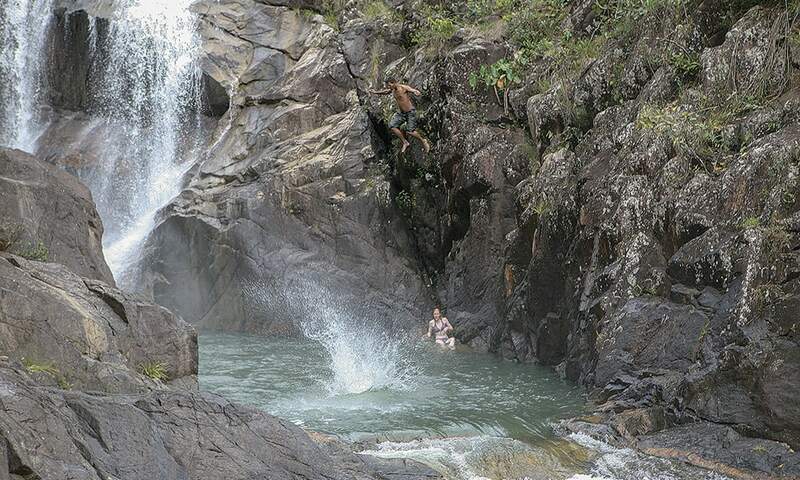 Darley cools off at Big Rock Falls while one of the lodge’s guides take the big plunge. Pine beetles had decimated the pine forest that we ventured through on horseback, my guide explained, as I navigated by a tree stump. Traversing forested trails, home to a variety of rare flora and fauna, our leisurely two-and-a-half-hour ride brought us to a secluded waterfall located in a lusher section of the forest. If you’re lucky, you’ll have the falls all to yourself. It’s here, after a short hike down, that you’ll want to have worn your bathing suit. All-terrain boots can be good for a lot of riding travel adventures where you may have to do some hiking—such as scrambling down the slippery rocks that lead to Big Rock Falls—and I appreciated having worn mine. I was hot and sweaty when we arrived, but that still didn’t prepare me for the cold waters. I took the plunge, peeling off my clothes and jumping into the cool pool of water. I followed my guide as he swam over to the waterfall. I did not, however, follow him up the rocks to a natural diving board, where he leaped off from up high, causing my heart to skip several beats. Rather, I splashed under the waterfall, cool for now, in the forests of Belize. If you’ve ever had visions of swimming under a waterfall to enjoy your own version of a natural massage, this is the place to do it. Back at the lodge, I indulged in a signature cocktail at the eclectic Jaguar Bar and then enjoyed the tropical view from a private cabaña. These thatched-roof retreats, tastefully decorated with antiques from Guatemala and colorful hand-made tiles, boast indulgent amenities like personal mineral-salted plunge pools and expansive decks. Best of all, as you fall asleep to the sounds of the Privassion River, which powers the resort’s own hydroelectric plant, you can feel good about staying at an eco-friendly, sustainable resort. If You Go: Blancaneaux Lodge: (866) 356-5881; thefamilycoppolahideaways.com.